A cultivar of Camellia japonica L. The flowers of ‘Atrorubens’ are small to medium, the outside petals deep crimson and heavy textured with darker veins, the centre of the flower filled with small, confused petals. [ICR]. ‘A very vigorous shrub; leaves large, ovate-lanceolate, attenuated at the superior extremity, very dentate, of a deep green, coriaceous bud of ordinary size with blackish scales; flower three inches in diameter, full, irregular, of a deep orange red, No.6; exterior petals in three rows, regularly placed, broad, imbricated, recurved and conspicuously displayed; those of the interior smaller, short, elevated, distorted, rumpled and separated from the first, forming a depressed centre; blooms with difficulty.-Superb.’ [Berlèse Monography p.83/1838]. 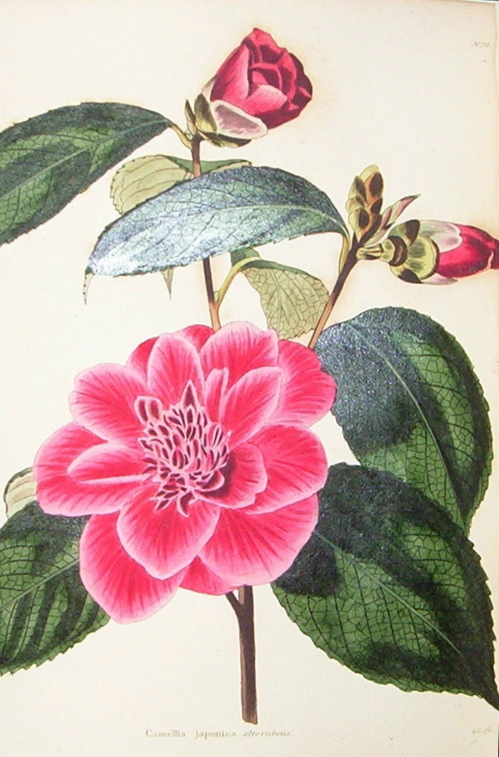 ‘We received the original plant of this magnificent variety from China in 1809. It differs materially from all other sorts, being of a more robust habit, and flowering a good deal later. The flowers remain upon the plant after fading, when they change to a deep purple red, producing a singular effect.’ [LBC no.170/1818]. Listed in all published catalogues [T.201/1843]. Probably received from Loddiges’ Nursery. 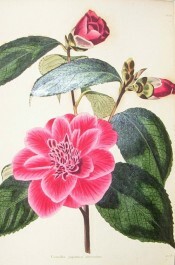 Atrorubens is listed in both the 1830 and 1836 editions of Loddiges’ Nursery catalogue, copies of which are held at Camden Park [CPA]. In the 1830 edition it is marked with a ‘+’, the meaning of which is unclear. In 1836 it is marked with a ‘c’, code for grown at Camden.